AAP. There is no denying that the word itself gets people interested. There is so much content being produced and consumed about the Kejriwal team, that no blogger craving for a larger audience can afford to not write something about AAP. Having given a hint about the purpose of this blog, I would like to go ahead and make it clear that I am not anti AAP or anti Kejriwal. The promise of a transparent and corruption free government is bound to make every Indian excited, and I am no different. In fact, for the first time since I started taking interest in politics, I am finding myself with the luxury of choosing between two leaders who deserve to lead the country. This is exciting news. Because so far, India has always seen the problem of lack of choices rather than the problem of making a difficult choice. Equally satisfying is the fact that for the first time, my generation has started taking active interest in politics. We are no longer indifferent. We are debating on key issues. Issues like malnourishment in a state and the economic growth under a chief minister. We are talking about the transparency in a party and the merit of candidates. We want to hear the opinion of PM nominees on key issues before we cast our vote. For the first time we are monitoring the steps taken by a CM during the first two weeks at office. 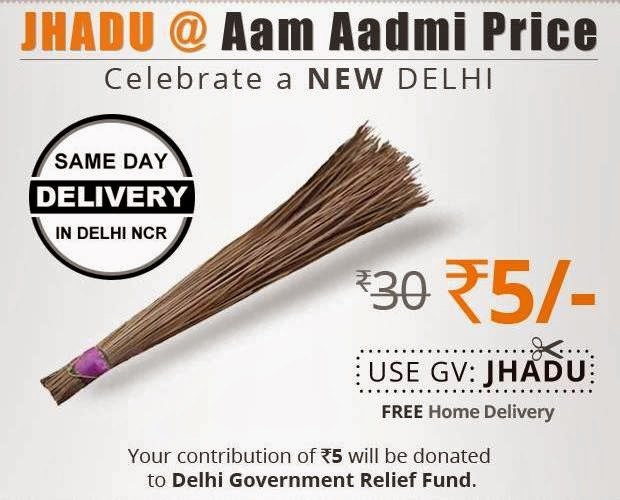 This I think is the biggest success of both NaMo and Kejriwal. These are the signs of a healthy democracy. Now let me mention a few areas which I find concerning. I will exclude all the issues which are already being discussed in the mainstream media. I will also avoid commenting on the policies which were announced post the results of Delhi assembly elections. 1) Target Audience: Who is Aam Aadmi? The AAP team has repeatedly focussed on the fact that unlike other parties, they are here to serve the common man, the aam aadmi. But who is a aam aadmi? From the public statements of party leaders, it seems almost everyone is an aam aadmi. From riksha waala to doctor. From an IT engineer in Bangalore to a professor in Jaipur. AAP's definition of aam aadmi includes everyone whether BPL person or someone earning 2 lacs per month. This surely does not look like a niche to me. From my experience of talking to VCs and entrepreneurs, I can say one thing for sure: If you say that you will cater to a segment which is unserved to by your competitors and in the same breath you say that your target audience is 95% of all users, you will be kicked out of the meeting room within five minutes. Why does not the party simply say that it aims to serve all Indians equally instead of focussing on the word 'Aam Aadmi'. Isn't this misleading. Though I can understand Kejriwal's point that other parties are corrupt and criminals, I know for sure that they can go to any extend to get votes. I fail to understand Kejriwal's claim that these vote thirsty parties are intentionally ignoring 95% of the voters. Does not make sense. 2) Merit: What Are The Metrics? As a transparent and democratic party, shouldn't there be more details regarding the metric for selecting its candidates? Unlike AAP, other parties have been in existence for years. There is supposedly a system in other parties where either family members of prominent leaders or businessmen with spare money to put into campaigning or party workers who over the years show there mettle in politics are given the ticket from specific constituencies. The metric made public has been that we will give ticket to honest people who want to serve the country. Both these parameters are not only subjective, but also have a ceiling. One can only be 100% honest, not more than that. I am sure that the party would claim that all its members are 100% honest. So how do you choose from so many honest people? Though you can personally talk to some shortlisted people and understand their past work, But with the loksabha nomination form available online, there are bound to be many applicants. How would AAP do the first screening? CGPA cutoff? GMAT score? Aptitude test? Aptitude test would be good start considering we would never want to have an honest yet foolish person leading our constituency or state or nation. I love the AAP agenda of inclusion in politics. It sounds good that everyone will get a chance to represent his/her people. It also sounds good that all party decisions will be taken in a democratic way keeping the opinions of key people in mind. But somehow this promise contradicts what I see on the AAP membership form and on the loksabha nomination form. What if I am an honest and patriotic citizen of India who wants to see his country grow, but I believe in some cause which conflicts with the Party objectives and want to continue working towards that cause? Am I not allowed to join AAP? What if I sincerely believe that acquiring land for the greater good of the society is a necessary evil and do not not want to bring laws which can impact this process? Should I forget about joining AAP and instead join the corrupt parties? How is this democratic in any way. A bunch of you guys have defined the party ideology and now new people will be added to that bunch only if they agree to your ideology. How will the party have any meaningful internal debate in future if everyone in the party has exactly the same ideology. Are you not creating too much selection bias? Stuff your party with people who have all left of centre views? The one above too is debatable. What if someone who has been convicted of a crime, served his sentence and is now a changed man. Is he not allowed to participate in your 'Aam' movement. Even after serving his sentence, he has lost his democratic rights? 4) AAP Supporters: What Is Your Stance? I wrote a blog post long back where I tried to give my analysis of NaMo as prime ministerial candidate. Soon the NaMo and Congress fan brigade started abusing it though I was being as neutral as possible. This is exactly what pisses the neutral people off who are trying to have a healthy debate. Are AAP fans doing the exact same thing now? Whenever anyone criticizes AAP, the fans would start giving example of other parties and how they are worse. That is meaningless. We have already agreed that there are problems with the existing political system and AAP gives us hope that they will be different from the existing players. So when someone says that AAP is doing politics of appeasement, I do not expect a counter argument that even others are doing it. Also, if AAP stands for aam aadmi and making them our representative, why are we rejoicing when CEOs of investment banks, editors from paid media, owners of companies are joining AAP? How are these people different? Every party has industrialists and journalists as its members. Does it mean anything? Kejriwal wanted to get the Lokpal bill passed. He also wanted to implement some other policies which he believed in. I will not start a debate about those policies, but I find it commendable that he seeks power to introduce his policies. It is a good stance. But the AAP team must understand that we support them because they seek power only to implement their policies. If it starts looking as if AAP is implementing certain policies, just to get in power, then the cycle is reversed. The clarity of means vs ends needs to remain intact. AAP is here to serve the nation, not to win elections. very nicely put up ! Nukul..well written and good points raised..
Education Loan is provided by banks and financial organization and covers fee for all years, which is normally paid out to the college/institute directly by the bank. Practice questions can help familiarize with the GMAT, but in the end, we need to be physically and mentally ready in order to answer the questions without any doubt.